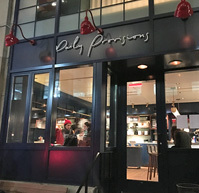 Daily Provisions is the perfect spot for breakfast, lunch and/ or a light dinner. The space, next to Union Square Cafe, is painted a robin egg blue with marble counters and sharing tables. Breakfast brings homemade crullers in flavors like cinnamon and maple, or grab an everything croissant with a smear. There are eggs served with Berkshire bacon, as well as toast with apple preserves. Breads can be purchased by the loaf, including salted caraway rye and multigrain walnut. We stopped in for a soup and sandwich. The vegetable soup, with chunks of grana padano, is perfect for a chilly afternoon. Oversized sandwiches with roast beef and rotisserie chicken are offered. Whole chickens can also be taken home for dinner. Service is very friendly. Credit cards are only accepted. No cash. A service charge is also included in the bill.